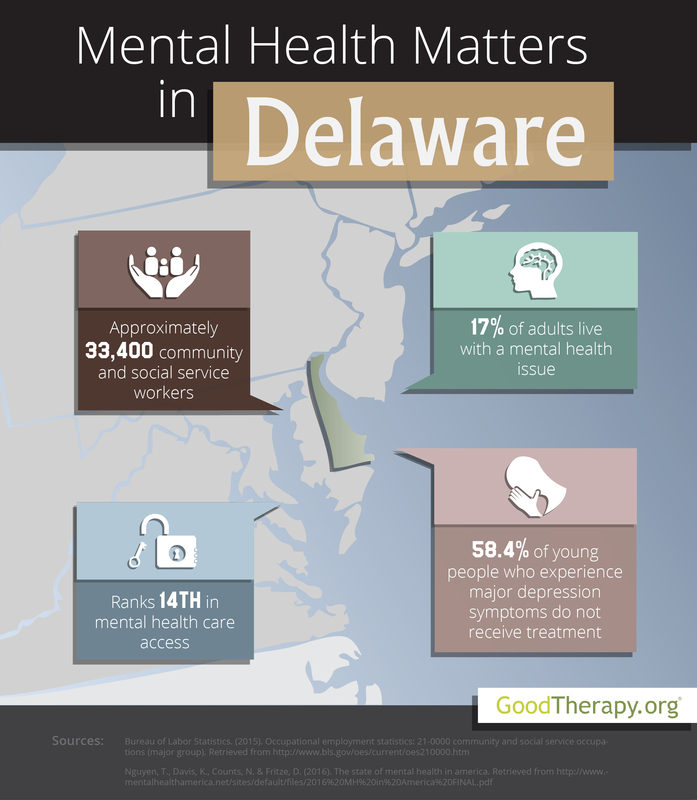 Find a therapist in Delaware with GoodTherapy.org. Statistics gathered by the United States Census Bureau show 945,934 people lived in Delaware in 2015. During that time, roughly 7,190 residents worked as marriage and family therapists, counselors at drug rehab centers, counselors at alcohol rehab centers, school guidance counselors, vocational counselors, health care workers, correctional treatment specialists, parole officers, religious workers, depression treatment therapists, and other community and social service workers. Residents who worked in these fields earned a mean yearly wage of $44,220. Mental Health America’s (MHA) 2016 survey on mental health conditions across the nation gave Delaware an overall rank of 16th—out of all 50 states and the District of Columbia. The states were also ranked in specific mental health care categories, with Delaware 11th in adult ranking, 23rd in youth ranking, and 13th in access to care. These rankings, in general, indicate lower instances of adults experiencing mental health issues and higher rates of access to care. Additionally, the youth ranking indicates Delaware is somewhere near the median when it comes to the prevalence of younger individuals experiencing mental health issues. The state was ranked a mid-range 21st in mental health workforce availability, with a ratio of 473 residents to each therapist in Delaware. According to the 2016 MHA survey, 9.5% of adults in Delaware exhibit abusive or addictive behaviors to drugs and alcohol. The state was ranked a low 39th in this care measure. However, Delaware received higher rankings in other categories. Among adult residents with mental health issues, the state had the 4th lowest percentage of people who reported unmet need and the 4th lowest percentage of people who were uninsured. Perceived risk may play a key role in determining whether young people engage in certain behaviors. To that end, researchers from the Substance Abuse and Mental Health Services Administration (SAMHSA) have highlighted general perceptions held by young people in Delaware on illicit drug use. A 2014 SAMHSA report states that in 2012-2013, about 78% of teens in Delaware perceived no great danger in using marijuana once a month—a percentage higher than the national average. This statistic also indicates an increase from 71.9% in 2009-2010 to 78.3% in 2012-2013. The MHA 2016 survey claims that 7% of children with private insurance did not have coverage for emotional or mental health issues. Despite these challenges, the SAMHSA 2014 report suggests some effort is being made to increase use of the mental health resources available in Delaware. Therapists and researchers from SAMHSA indicate 77.5% of adolescents report improved functioning after receiving care via the public mental health system, compared to the national average of 69.3%. Delaware also has a higher percentage of treatment for teenagers and adults with drug dependence issues than the national average.